← Venite Adoremus! O Come Let us Adore Him! The television premiere of the ½ hour documentary “Msgr. 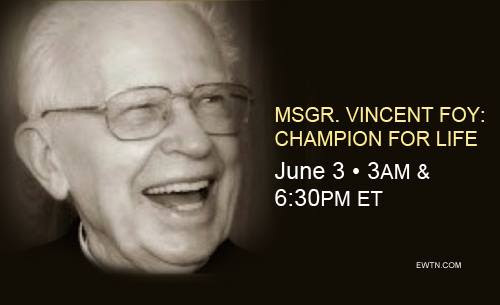 Vincent Foy, Champion for Life” will air on Eternal Word Television Network on Wednesday, June 3, 2015 (my 76th Ordination Anniversary) at 3am and 6:30pm ET and in a repeat broadcast on August 14, 2015 (my 100th birthday) at 3am and 6:30pm. Thanks to EWTN, Dunn Media & Entertainment and all who helped with this production. It can be viewed live on EWTN’s channel or online via the EWTN website. A celebration of “Pro-life Man of the Year” Msgr. Vincent’s Foy’s life, whose defense of Church teachings on family and marriage earned him a papal commendation. This entry was posted in 77 YEARS & 8 MONTHS A PRIEST, AUTOBIOGRAPHY, BIOGRAPHIES & OBITUARIES, LIFE ISSUES. Bookmark the permalink.